We arrived in St Thomas, USVI on Monday, spent the night, and headed out Tuesday morning to Virgin Gorda, BVI for a weeks vacation. Orginally we were scheduled to leave St Thomas by ferry directly to Virgin Gorda, however our ferry did not show up - so we were routed to Road Town, Tortola - and then on to Virgin Gorda. Sonny, the on-site Sunset Watch Villa Manager, along with Ray Harrington, Island Style Jeep Rentals were waiting at the ferry dock when we arrived. After renting a small red SUV, we followed Sonny's car up the winding roads to the villa property. Sunset Watch Villas sits directly on Nail Bay, and consists of three villa properties which can all be rented for families or friends traveling together - or each of the villa's can be rented separately. 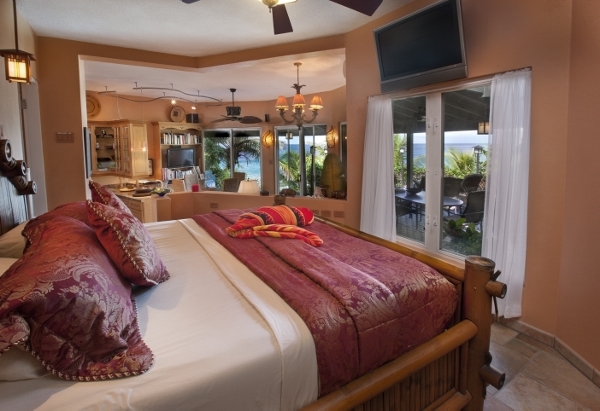 Sundowner is the only one bedroom, and that's where we are spending our vacation. It's the picture perfect tropical beach font hideaway. Upon arrival, you follow stone steps up to the villa, and the outdoor living space comes into view as you continue along the walk way. The patio area is quite large with multiple seating areas, a private infinity pool, BBQ grill, bar, large dining table - and views of the sea and neighboring islands are awesome. The one bedroom villa is absolutely lovely, and exactly as pictured on the villa management website. As you walk around, you have the feeling you will be "house-sitting" in someone's well appointed personal home. Very shortly after arriving, I made my way down to the beach area, and took note of several kayak's on the bottom landing. I went for a brief swim, and the water was like a warm bathtub. Nail Bay is just as I pictured with large rocks and boulders that are infamous to the British Virgin Islands. On my return to the villa, my husband had located kayak paddles, scuba equipment provided by the villa, along with two comfortable chairs to take down to the beach area. Buck's Grocery Store delivered food supplies prior to our arrival, and the fridge was stocked with fruit, cold cuts, beverages and snacks. While I don't plan to cook, the kitchen is fully stocked with just about everything a guest could desire if choosing to cook meals on-site. The kitchen is equipped with electric stove, dishwasher, microwave, small toaster oven, and coffee/cappachino machines, and in-sink-errator for instant boiling water. There are ample pots, pans, dishes, glasses, silverware, along with many things I did not expect such as coffee filters (which I forgot to pack), plastic containers, plastic bags, foil, and just about every spice you can imagine. You won't have to bring an over abundance of clothes as the villa has a washer/dryer, and laundry detergent on hand. A safe is provided for valuables, and there's plenty of closet space, a wicker chest, along with shelving to place all your clothes and personal items. The extra large outdoor shower can be accessed from the back of the patio as well as inside the bathroom. It's convenient getting out of the pool, or coming up from the beach and accessing the shower without tracking through the villa. While in the shower, you have the feeling of being close to nature, while having the privacy of non-see through glass. There is a lock on the inside door leading from the shower into the bathroom area. We're keeping an eye on Tropical Storm Isaac, as well the the tropical depression right behind it. We had plans to visit The Baths, Devil's Beach, and take the ferry over to the Bitter End Yacht Club within the next few days - however that could obviously change due to weather conditions. So far it's been breezy with pockets of sunshine followed by a little rain which has not lasted that long. Will post more later . . .